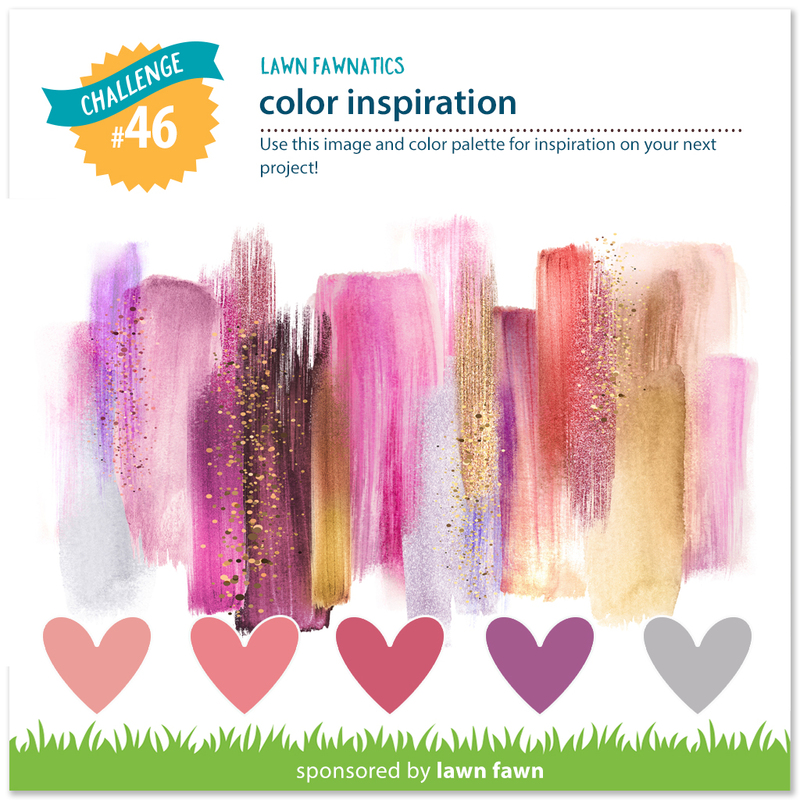 To start I blended my background panel using colors similar to the inspiration photo. I blended Seedless Preserves, Picked Raspberry, and Worn Lipstick distress oxide inks onto a piece of strathmore bristol cardstock. I let it dry for a few minutes and then splattered it with shimmer spray. I blotted off the excess water and then splattered the panel with gold paint from my finetec palette! Once it was dry I trimmed it down to 5.25″ by 4″ and adhered it to a white card base. 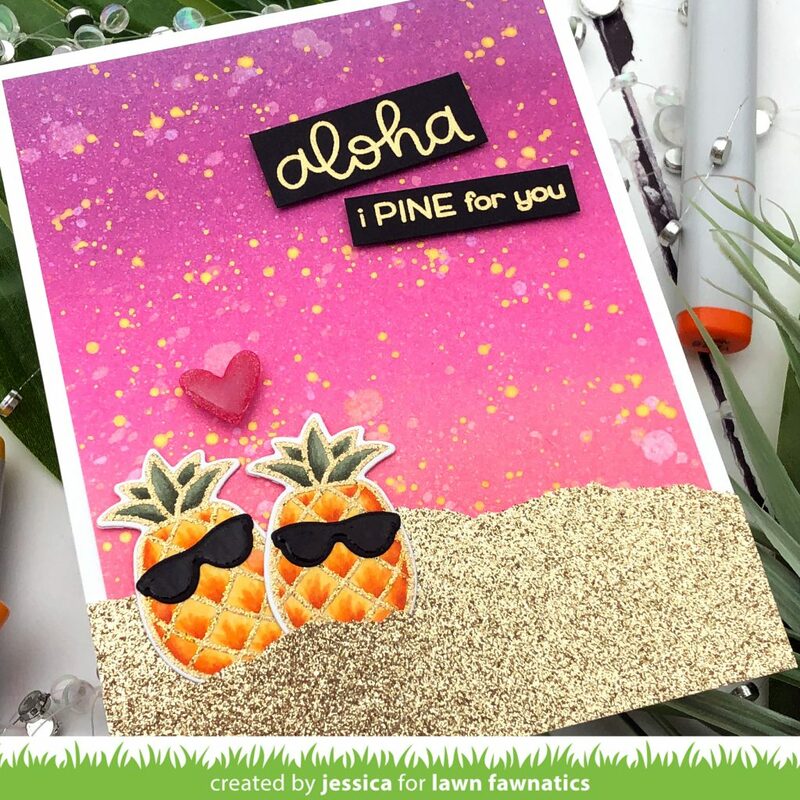 Then I stamped the sentiment from Aloha onto black cardstock with versamark and heat-embossed it with gold embossing powder. I trimmed it down to thin labels and adhered them to the blended panel with foam mounting tape. Next I stamped the two pineapples from Aloha and heat-embossed them with gold embossing powder. 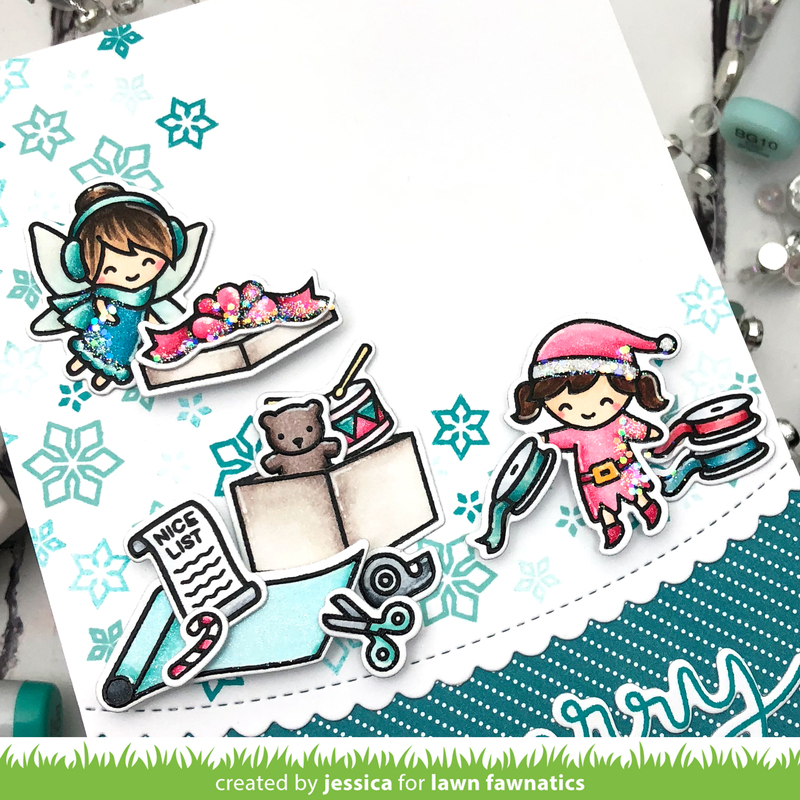 I colored them with copics and then die-cut them with the coordinating dies. I also stamped the sunglasses onto black cardstock and heat-embossed them with clear embossing powder before die-cutting them with the coordinating dies. Then I die-cut a heart from raspberry cardstock and added a layer of spectrum noir clear sparkle over the heart. I also tore two pieces of gold glitter cardstock to create a sandy beach and tucked my sunglass-wearing pineapples into the beach. Then I adhered the heart with foam mounting tape and added a layer of nuvo crystal glaze to finish the card! So super cute! love the pineapples!! Jessica, you the queen of blending! This is a stunner. I hope you are proud of your work because it’s amazing. Well done my friend! 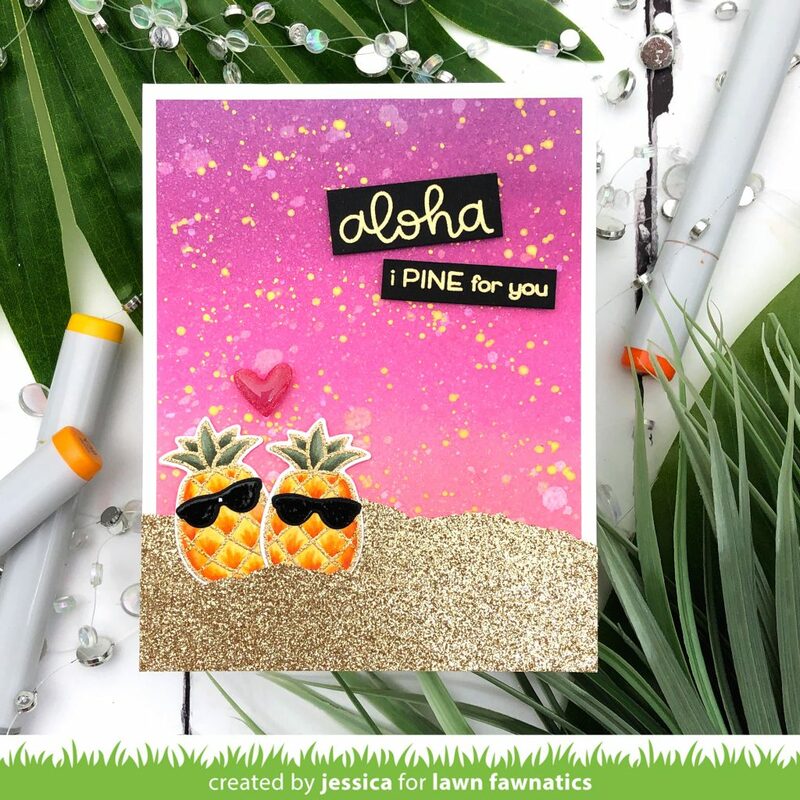 Jessica, this card is delightful…the punny sentiment a perfect match for your pineapple beach setting. Thanks for sharing such a well crafted, fun card. Adorable, Jess, love the sunglasses! 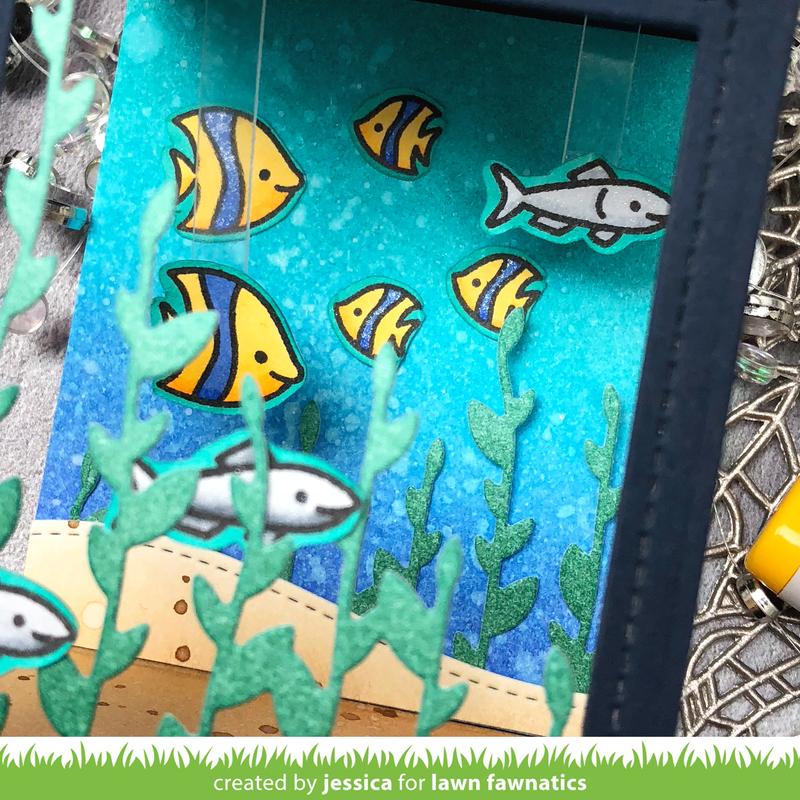 I love how you created such a fun and sweet card from that gorgeous mood board. 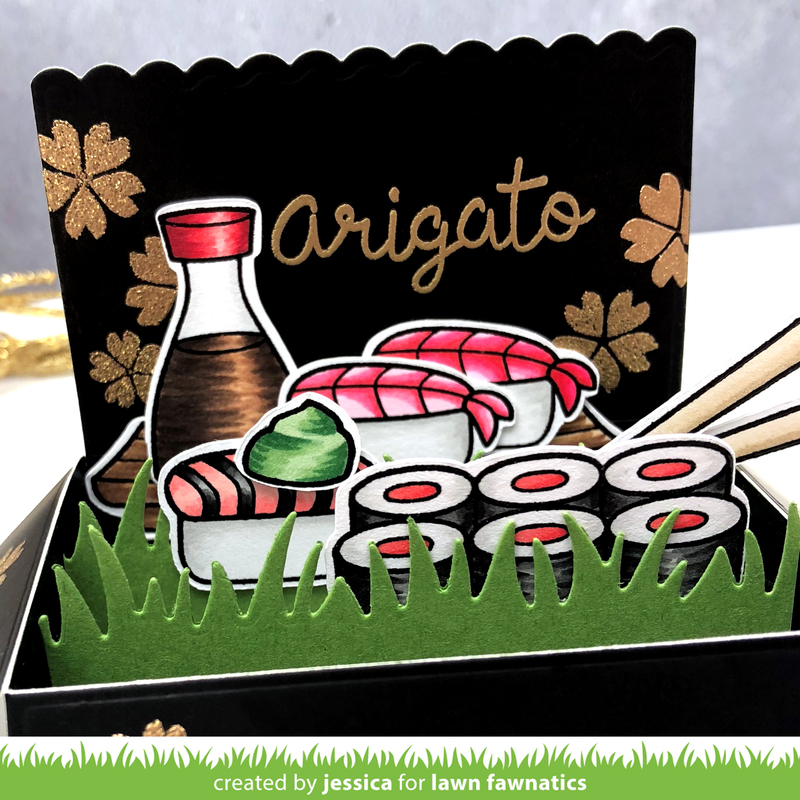 Such an adorable card, Jessica!